October wouldn’t be October without an apple recipe. At Sweden’s smallest factory, which happens to be devoted to apple products, I tasted the most heavenly little apple cake with a cup of freshly brewed coffee. I tasted carefully in order to record the ingredients on my tongue and recreate at home. Here is what I came up with and it is very good. The upside is that you can eat it in thin, small slices. The downside is that it does contain those bad boys, refined white flour, sugar and butter. This recipe contains no eggs. Preheat the oven to 200 C or 392 F. Grease a pie dish. Prepare the apples and toss in lemon juice. Melt the butter in a pan, remove from the heat and blend in milk. Start with 4 dl. Combine dry ingredients in a bowl, make a well in them and pour in the butter and milk liquid. Blend with a hand-held beater. The batter should not be too stiff. Add milk if it is hard to mix with the beater. Pour the apples into the batter and mix into the liquid. Pour the batter into the pie dish. Bake for 20 minutes or until lightly browned. 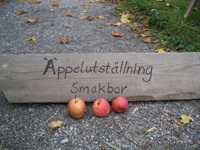 Learn more about Sweden’s smallest factory devoted to apples at Julie’s Nordic Island. The Makings of a Great Fruit Salad! There are fruit salads and then there are FRUIT SALADS. I recently invited some friends over and one of them insisted that she must bring along her fruit salad: “I make a mean one”, she said. “O.K., O.K.”, I thought. Must let the guests participate. My friend arrived here with several plastic bags full of fruit and promptly asked me for a large bowl. Within a short time, she walked in with the most luscious looking fruit salad that I have ever seen. Just the visuals were a joy to behold. The taste was out of this world. I was humbled. Never doubt the guests! 1. Squeeze lemon juice into the bottom of the bowl. 2. Start with the apples – they are firmest. 3. Cut in small bit-sized chunks – no big challenging chunks! 4. Make sure you remove the peel – the secret to the softness of this delightful fruit salad. 5. Add in other fruits starting with firmest and progressing to least firm. Bananas always come last. 6. Don’t throw in any crunchy stuff – nuts, raisins, etc. – keep this a smooth affair! 7. Just prior to serving, pour over a fruit smoothie with a light color. Make sure you choose a high quality smoothie with low sugar and high fruit content. You can make this yourself or buy one from the supermarket. 8. Garnish with some decorative fruits such as physillis. I warn you, if you do this right, it is an other-worldly experience! Don’t forget to check the Nordic Wellbeing Cookbook for other great fruit recipes! If there isn’t something sweet available in the kitchen as the day wears on, I begin to hear a certain scrounging going on in the kitchen. Empty chocolate wrappers get frustratedly thrown into the garbage and family members begin to look around in the various little dried fruit jars and other “sweet” storage containers I have around the house. My family is rampant with sweet tooths! Any doctor will tell you to cut out the sweets. Your body doesn’t need anything sweeter than fruit. Still, there is that longing for a little extra beyond the wholesome apple – so why not make something good with it that isn’t hard to prepare (with a little practice) rather than having everyone scrounging for those wrappers? 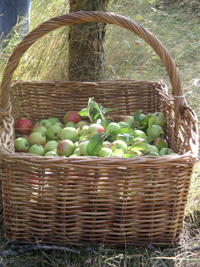 If there is something that is easy to come by in the autumn where I live, it is an aromatic apple. 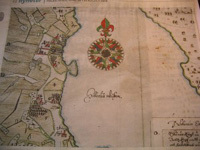 In a local newspaper article, I just noticed a very interesting historical fact discovered about apple growing in my vicinity: a newly-discovered map drawn sometime during 1630-1640 shows that Sweden’s oldest apple orchards were located near here in a place called Färingsö on Lake Mälaren. In the international apple world, Sweden has a reputation for most flavorsome and greatest variety. It’s got to do with our blissfully long summer days in which there is an intensive build-up of sugars, fruit acid and aromatic substances and our short nights in which those processes take a short break. Steeped in history, I set about making something sweet for the family using the overflow of apples I have in my kitchen at this time of year. The result was pleasing – 4 out of 5 stars from the family. I used a bit of the leftover apple sauce I had prepared for visiting one-year-old twins this past weekend underneath the fresh cut apples on top of the pie with a tangy and lagom (a very useful word in the Swedish language unavailable in English meaning just right) moist result without loosing the crunchiness. Pie takes a little effort in the beginning but once you perfect the crust, it really isn’t a big deal. Remember – efficiency and convenience is often also about skill honed by practice! You can also go for the ready-made pie crust but it’s not as good and you don’t have control over ingredients which is an important feature of a healthy kitchen. Preheat the oven to 200 C or 392 F. Grease a 22-23 cm or 9-inch pie dish. Mix all crust ingredients together in a food processor until they wrap into a ball of dough. If the dough is too loose, add a tablespoon of flour. If it is too dry, add a tablespoon of water. Roll out the dough with a rolling pin on a floured surface. Alternatively use my little trick of rolling it out in between two sheets of floured baking paper, making it easier to lift into the pie dish. Line the pie dish with the dough. Cut away remaining dough (don’t waste it! line a mini-pie dish if you have one with what is left). Bake 7 mins. Remove from the oven and add filling. Prepare the apples and slice into a bowl. Sprinkle with lemon juice, cinnamon and brown sugar, and toss. Spread the apple sauce evenly over the pie crust. Place apples in a round arrangement sprinkle over the almonds. Place a few butter cubes on top of the pie (be sparing!). Bake 25-30 minutes, making sure that the nuts do not burn. Place all ingredients except for the corn starch and water in a cooking pan over low heat. Stir gently with a wooden spoon as the honey begins to melt. Allow to cook but not boil until the apples are soft. Test consistency. If thick enough, leave corn starch aside. If too watery, mix corn starch with cold water in a separate bowl and add gradually to the cooking pot until the sauce has reached the desired consistency. Purée if desired. Enjoy just as it is or in my lagom apple pie! If I’ve just awoken your curiosity about apples (I sure hope so! 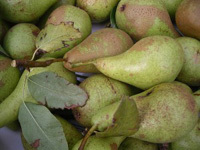 ), check out the archived articles Wisdom Tree and An Apple A Day and the Nordic Wellbeing Cookbook for more superb savory and sweet apple recipes.